Adobe recently released the beta version of their newer version of Flash player 10.2 version with a few great additions and enhancements of features, that enhanced the video playback performance by a good fold. A few new additions include Stage Video hardware acceleration which tends to reduce the processor usage, and enabling higher frame rates and reducing the memory usage. The new version also enhances the Internet Explorer 9 performance by taking the advantage of the hardware accelerated graphics, and utilizing the hardware rendering surfaces to improve the graphics with a better performance. Download the Flash plugin that you wish to use with Google Chrome (there are 2 players available in the download page, one exclusively for the Internet Explorer 9 and the other one for all browsers). Open Google chrome, type about:plugins into the address bar, and hit enter. Click on the Details on the top right of the window to expand the details of the plugin. Then find the flash plugin that is being listed there, and hit Disable. 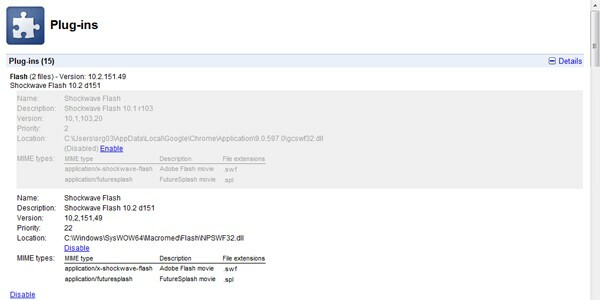 This would disable the default or built-in flash player that is running with Google chrome. 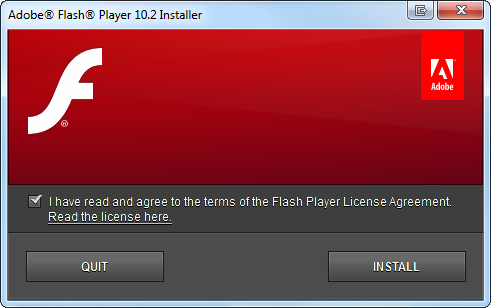 Installing the new version of Flash player would then make it work automatically on Google chrome too. Even though there are so many releases and changes with the flash player, Google chrome sometimes fail to make the use of flash player, and so here is how to install flash player on chrome, if the installation by default doesn’t work perfectly.